European Communities (Access to Information on the Environment) Regulations 2007 to 2014 (hereafter referred to as the AIE Regulations), give legal rights to those seeking to access information on the environment from public authorities. The AIE Regulations provide a definition of environmental information; outline the manner in which requests for information may be submitted to public authorities and the manner in which public authorities are required to deal with requests e.g. timeframes for response. The regulations also provide for a formal appeals procedure in the even that a person is unhappy with a decision on their request. 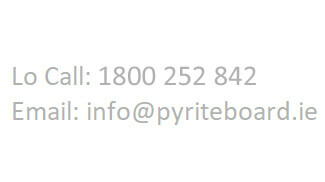 Applications for Access to Information on the Environment should be made to info@pyriteboard.ie or sent by post to the AIE Officer, Pyrite Resolution Board, 7 Eastgate Avenue, Little Island, Cork, T45 RX01. Is there a charge for getting information under the AIE Regulations? As provided for in the AIE Regulations, there is no initial fee required when lodging a request for information under AIE. A public authority may however, charge a reasonable fee for supplying environmental information in accordance with the Regulations. If you consider that your original request for environmental information was refused wholly or partially, or was otherwise not properly dealt with in accordance with the provisions of the AIE Regulations, you may, not later than one month following the receipt of the decision from the PRB, request that the PRB carry out an internal review of the decision in part or in whole. If after the internal review, you are unsatisfied with the decision and would like to make a complaint or appeal the decision again, you can do so by contacting the Office of the Commissioner for Environmental Information (“CEI”). You must appeal or make a complaint to the CEI within one month of getting the reviewed decision from the PRB.